Strong police surveillance and civil society resistance yesterday kept at bay religious bigots who had threatened to seize an Ahmadiyya mosque in the city’s Nakhalpara while Ahmadiyyas in Brahmanbaria held the Friday congregation sans Azan under police guard. In Narayanganj, too, fear of arrest held the local fanatics off Missionpara Ahmadiyya Mosque they had declared last month to capture yesterday. Ahmadiyya Muslim Jamaat, Bangladesh (AMJB) thanked the government and hailed the civil society steps noting the government’s role proves it can resist the fundamentalist menace if it wants to. 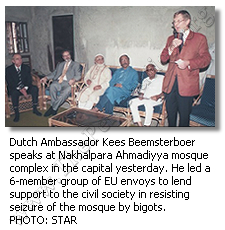 Expressing solidarity with the Muslim minority sect and to lend a hand to the civil society move, a delegation of the envoys of European Union (EU) countries visited Ahmadiyyas at Nakhalpara mosque. The delegation hoped the government of Bangladesh would ensure the fundamental rights of all the peoples including Ahmadiyyas. Amnesty International (AI), meanwhile, expressed deep concern for the safety of the country’s Ahmadiyya community following threats issued by Islamist groups during Salat-al-Jumaa yesterday to raid what they termed were Ahmadiyya places of worship. International Khatme Nabuwat Movement, Bangladesh (IKNMB), the most aggressive group of anti-Ahmadiyya agitators, yesterday threatened the government with a massive countrywide movement if it does not pass a bill in the current parliament session proclaiming the followers of Mirza Golam Ahmad Kadiani non-Muslims. To thwart the IKNMB bid to capture the Ahmadiyya mosque at Nakhalpara in Tejgaon, a large number of civil society members led by Justice K M Sobhan went there and took position inside the mosque yesterday morning. South Asian People’s Union against Fundamentalism and Communalism, Ekatturer Ghatak Dalal Nirmul Committee, Awami League and different left-leaning parties were the leading organisations that mobilised the anti-IKNMB civil force. Among the prominent civil society members were Shahriar Kabir, Salma Haq, Ferdousi Priyobhasini, Doulat Ara Mannan, Kazi Mukul, Ruhin Hossain Prince, Abu Osman Chowdhury, Abdus Samad, Meer Hosain Akhter and Ali Hasan Tarun. The six-member ambassadorial delegation of the EU countries led by Ambassador of the Netherlands Kees Beemsterboer joined the civil society members before Jumaa. The other delegates were the ambassadors of Germany, France, Italy, Sweden and Denmark. To the Ahmadiyya leaders present, the envoys expressed their concern at the ongoing anti-Ahmadiyya agitation and push. Members of Dhaka Metropolitan Police and Armed Police Battalion (APBn) stood guard at the mosque in the morning. Contingents of police, APBn and paramilitary Bangladesh Rifles were deployed at Nabisco intersection in Tejgaon before Jumaa. Some 5,000 IKNMB zealots came in several processions from different mosques after Jumaa and gathered at the intersection. Addressing a demonstration there, IKNMB leaders said Ahmadiyyas have no right to live with the identity of Muslims in Bangladesh. Threatening the government of paralysing the country if it does not legislate in the current parliament session proclaiming Ahmadiyyas non-Muslims, he said no government would be able to stay in power without fulfilling their demand. “No-one will be able to stop the forward march of the soldiers of Islam in Bangladesh,” he challenged. The IKNMB ameer also condemned the foreign diplomats for what he said was meddling in the country’s internal affairs and visiting the Ahmadiyyas at Nakhalpara. Ruling coalition partner Islamic Oikya Jote Secretary General Abdur Rab Yusufi, Islamic Shasantantra Andolon Joint Secretary ATM Hemayetuddin, Khelafat Andolon Secretary General Zafrullah Khan, IKNMB Secretary General Nazmul Haq and leaders Abu Zafar Kashemi, Abul Kashem and Gazi Ataur Rahman also spoke at the rally. Traffic on Tongi Diversion Road remained suspended for two hours as IKNMB activists kept it blocked from Mohakhali to Satrasta intersection during the demonstration. Instructed by police, Ahmadiyyas omitted Azan for Salat-al-Jumaa at Bhadughar Mosque in Brahmanbaria fearing it might incite the bigots to attack their mosque, reported our Brahmanbaria correspondent. Riot police guarded the mosque and patrolled the area since the morning to bar the zealots, who on October 29 had attacked the mosque, injured 11 Ahmadiyyas and vandalised their houses, from approaching the mosque. police activism drove away the Khatme Nabuwat members, who had threatened to burn down the mosque and Ahmadiyyas if they pray there any more. The town continues to be gripped by tension as the Nabuwat activists has threatened to punish the locals for protesting the October 29 attack. Local anti-Ahmadiyya operatives who, after failing to capture the mosque on October 8, had threatened to make another bid yesterday or the coming Friday, were not seen in the area.